Locked thread | Replies: 1478 (Who? ), Viewed: 275029 times. #1 17th Nov 2005 at 1:46 AM Last edited by Numenor : 5th Nov 2008 at 5:47 PM. All the messages posted prior to Dec., 31st 2005 have been moved (not deleted) to an ARCHIVE THREAD, purposely created. If you need to read back some old post, please refer to the Archive (no posting allowed on the archive). This thread, on the other hand, will stay active: you are all welcome to post here, asking for help with your creations. 2) Please post a detailed description of your problem, providing the faulty package(s). 3) This is a place where you can learn new things: we will fix your packages for you, if possible; but we will also give detailed information, explaining why the package didn't work: we strongly suggest you to read the provided info, so not to make the same mistake a second time. If you feel inclined to give your assistance, answering to questions that you know the answer to, you're welcome to do it, and this is much appreciated! Lastly, let's give one more big THANK YOU to our Mesh Maestro, JWOODS for having created this thread; we all hope that soon all his problems will be solved and he will come back here, providing his valuable help, and sharing his great knowlodge again! Hi everyone. I'm having great difficulty finding my mistake in my new packages. I began by cloning a painting (into graffiti) and modifying it to suit my needs (1x1 size, custom mesh, texture, catalog info etc). I recolored the graffiti package and things were looking fine. Then I cloned my graffiti package to make a graffitiwide package, the same thing again but on a 2x1 size instead (updated mesh, texture, etc). When I made a recolor of graffitiwide, the recolor showed up on the original graffiti object instead of the graffitiwide package! I figured it might be something to do with the subset names so I have been through, checked the MMAT GUIDs, subset names in GMDC, GMND, SHPE and everywhere else I could think of. I have checked that tsDesignMode cDataExtension refers to the correct place, and spent about 6 hours on these forums looking for a magic solution. There's a lot of useful stuff on here, but with not knowing the exact problem, it's hard to solve. My problem is that graffitiwide will allow itself to be recolored, but the new recolor does not show up in the game, and the scenegrapher is reporting 'false' instead of 'extern' for the CRES information. I would really appreciate it if someone would look at both the graffiti and graffitiwide packages in the attached ZIP, see what I've done wrong, make it so that both these objects can be recolored and appropriate recolors appear under the correct object's design options and come back to me to let me know exactly where I went wrong. I'd really benefit from knowing what my mistake were here so as to not make them in the future. Thanks! The wide graffiti one's MMAT was not pointing to the main GUID of the object, which is 0x000AE80E. I fixed that for the MMAT of both the main object and the recolor, and it works now. For the one-tile graffiti, the subset name in the tsDesignModeEnabled was incorrect. It has to be fw190a8_graffiti_painting but it was something else. I changed that, and now that one should work, as well. However, you really should not use the underscore _ in subset names! I suggest you change all the underscores to dashes - instead, or just remove the lines altogether. Having the underscore may cause problems. Here are the fixed packages in case you want to double check what I just explained here. First of all, I really owe you one IgnorantBliss. You have fixed my packages so that they work as intended in the game and are recolorable with SimPE. Thank you so much! Thanks for explaining the error of my ways too. Hopefully, the more of this I do, the more I will learn to get things right on my own. Secondly, could anyone provide an explanation as to why underscores are not a good idea in subset names? I have no problem using dashes or another system, but I would find it really useful to know why underscores cause problems. Thanks! I'm not sure why, but I think the underscores are a problem especially with recolorable subsets. Maxis uses underscores in subset names, too, but, from my experience, it's usually for subsets that they never made recolorable. Numenor would be a better person to explain exactly why. It has something to do with how SimPE sees the the file names, and the underscore has a "special" meaning in some cases. This is my plebeian explanation on the issue as I understand it, though . I've got this Exit Sign I'm trying to make for my game. I've imported the mesh using SimPE .52. Now I'm lost a texture the mesh. Can somebody please help me out with that? Do you mean you've lost the texture to your mesh, or that you're at loss trying to texture it? Have you uv-mapped the mesh? Have you tried putting a texture on it yet, and what kind of problems are you having if so? Which object did you clone it from? highlighted Guid typed the new GUID in the value section commited the change saved the package but when I opened my game the new wallpaper still replaced the old one. Can you tell me why? Am i doing something wrong? Did you only look at the thumbnail of the wallpaper or did you try putting it on a wall? It could just be that the thumbnail of the wallpaper wasn't updated after the fix. In this case, you can delete the package files in your Thumbnails folder in your Sims 2 folder in My Documents, and let the game generate new ones the next time you go to the catalog in game. I deleted the whole package, thumbnail and even bak file and recreated the whole thing with the new GUID in the package with the same results. My new wallpaper shows up. I can place it on walls and everything but the wallpaper I cloned has disappeared. I don't care much in my own game but if I upload it I will be causing the same problem in someone elses game. Would you like to try uploading your package file here for someone else to take a look at? I've never made wallpapers with SimPE, but I'm willing to try to figure this out . Zip/rar it up and post it as an attachment. I have attached the package. the assigned GUID is 0x0019F401. This is driving me crazy :gonemad: Thanks for the help. The maxis wall I used was Wall bamboo. When I look at walls made with Homecrafter, they only have a value "aaaaaaaaaaaaaaaaaaaaaaaaa" in that Filename field. Odd. Maybe it just needs to be anything else but the original Maxis value? I will have to experiment with this one. Thank you very much :jaw: And the light goes on. I never thought to compare it to a homecrafters recolor. I miss my homecrafter wish I could fix it But now that I have this fixed and figured out it will be great. I appreciate all your help. We need a wallpaper specific tutorial for SimPE badly. The fence tutorial is too different from what you need to do with walls. I haven't uv-mapped the mesh yet. 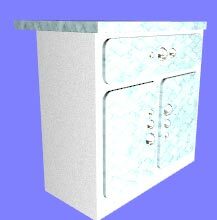 What program do I use to uv-map a 3ds mesh? I'm not personally familiar with 3DS, but I believe it has its own uv-mapping function. Check out this topic for more. How do you convert a mesh from 1 format to obj? I've been trying to do that with several free meshes I found and would like to see in my game but I haven't been able to convert the meshes right yet. #20 6th Jan 2006 at 5:20 PM Last edited by Pistachio : 7th Jan 2006 at 11:14 PM. This is a real newbie problem which I'd appreciate some help on. I think my essential problem here is that what little I do know about making objects is very out of date. My specific problem is I'm trying to make a counter island, the attached file works all fine, does what I want it to but the recolours don't show up. I had the same problem on the regular counter I made to do with this but that seemed to allow itself to be fixed by correcting the material def reference in the shape, if the same problem has happened here I've missed it. The odd thing is the design mode icon for the recolour shows it as it ought to be but it doesn't update the texture on the counter when its selected. The set of items this belongs to has been kicking my backside all week and I'd love to get it polished off and published as soon as humanly possible so I never have to look at it ever again!! Artists - Get your own Studio! Always be featured! Depends on the format, Milkshape does support a wide range of different formats including .obj & .3ds so its a good program to have for that sort of purpose. Or alternatively if its an expensive program you don't have access to then you could always find someone who does have it and ask them nicely to convert a batch of them into a different format that you can use. could you upload the mesh as well? Lethe, the mesh was included in the package that I downloaded. I still haven't been able to figure out the problem, though. I have a feeling it has something to do with this being an island that originally borrowed its textures from the normal counter, but now it's a stand-alone object. Kate, do you have a normal counter that goes with this? Maybe linking to it for textures would work. I made a paiting and I'd like to recolor it, but I can't find it in "decorative > wall" ! I thought my object had a problem but I tried to download an object already recolored by the creator and I still couldn't find it !! How should I proceed then ? Do you mean you can't see your painting at all, or you just can't see the recolor you made? Do you mean you can't see any custom painting created by other people, either? Do you have custom content enabled in your game?